To all the party freaks out there! Are you ready to enjoy the Canada Day with a party bash? Get ready for an amazing party experience on the cruise. 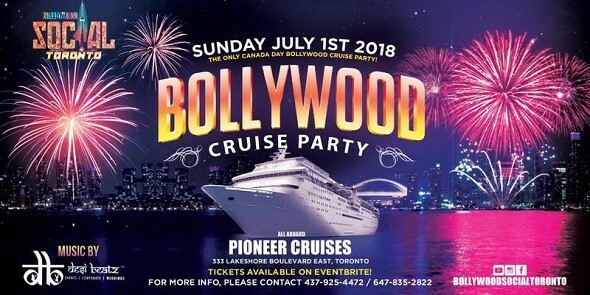 Bollywood Social Toronto presents Bollywood Cruise Party - The Only Canada Day Bollywood Cruise Party! Yacht parties offer an incredible experience of sailing along with your friends and at the same time enjoy the excellent music, exotic drinks and food! This is a big opportunity to make the Canada Day more special with your friends. This Bollywood night will definitely be a perfect Sunday evening that will be hard to forget. Moreover, all the music will be played by the Desi Beats. You can enjoy the unlimited Bhangra, Bollywood, Hip Hop, EDM music and burn down the dance floor. You will enjoy the amazing view while sailing along with your friends on the yacht. This view will be best enjoyed by the exotic drinks and delicious food available on the cruise. So, what are you waiting for? Pick up your favorite clothes and get prepared to sail along with your friends!